Meteorological winter is now here. It is important to keep a close eye on your pond. Extreme cold can be stressful on your fish. You need to make a decision to shut down the pond for the season or keep it running in our Virginia climate. There are advantages to both and you can make the decision based on your needs. 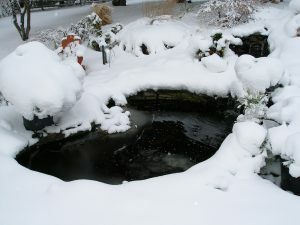 Generally it is fine to run the pond through the winter in the mid-Atlantic region. This will provide a hole in the ice as well as the supply the oxygen the fish need. You must, however, make sure there is enough water in the pond to operate the pump. There will still be evaporation and ice dams that will require some water to be added periodically. We suggest you have a short garden hose stored in the garage to add water if needed. There is nothing more beautiful than a waterfall covered with ice formations and snow during the winter. You must, however, be careful with ponds that have long or slow-moving streams. In such cases, ice dams can form and divert water over the liner. If you decide to leave the pond running, you will be rewarded by beautiful ice formations. You will also be providing water to birds and mammals. Our feathered friends still need water in the winter. A running stream or waterfall will attract many birds to your pond. If the thought of lugging a hose around in the cold weather is unpleasant, then shutting the pond down is much easier. Many of our Virginia pond customers choose to shut down their pond for the winter because they don’t want to worry about ice dams or pay for the cost to run a larger pump. If you chose to shut down your waterfall for the winter, you’ll need to replicate the effects of the waterfall by keeping the water oxygenated. You will need a floating de-icer. These de-icers do not heat the water. They simply emit enough heat to leave a small hole. A de-icer does not provide oxygen. It only allows toxic gasses to escape. You will need to supplement this with an aerator. The aerator should not be located at the deepest part of the pond. An aerator in the bottom will disrupt the thermo cline layers. Your fish will go to the bottom to find the most stable temperatures. Put the de-icer on a shallow area or shelf. Since we do get sub-freezing weather in Virginia, you should pull the waterfall pump from your skimmer and store it for the winter in a frost-free location, submerged in a bucket of water. The water around the pump housing will prevent the seals on the pump from drying and cracking. Since most submersible pumps are oil-filled, it is not recommended to let them freeze solid. To extend the life of the pump, it is a good idea to clear the impeller shaft free of any debris before the onset of winter. If you have a bead filter system and external pump, we recommend that you shut the pond down for the winter. You filter system and pump should be drained and winterized. If you lose power, then the pump and pipes may freeze and break. Remember that the Pond Doctor is available all year to assist with all your pond maintenance or repair needs. You can call us direct at (540) 272-6866 or purchase pond supplies and equipment from The Pond Store on our website.